These kids really do crack me up. 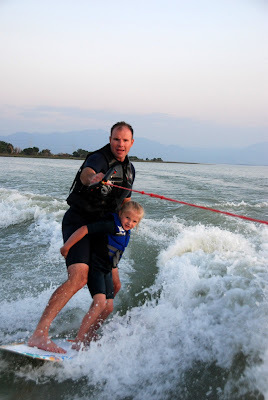 The grins, the hand signals, the fear on their faces when there is a bump in the water. I love these kids and am so glad that we have been getting to spend so much time on the boat. It's really been a very good thing for our family. We are finally remembering that building memories is more important than having a perfectly clean house and constantly manicured yard. Oh, don't get me wrong- those things are still important and we have lost some sleep over it but it is SOOOO worth it. I am not a boater but I can see myself becoming one. The other night, we decided, at the last minute, to go out on the boat. 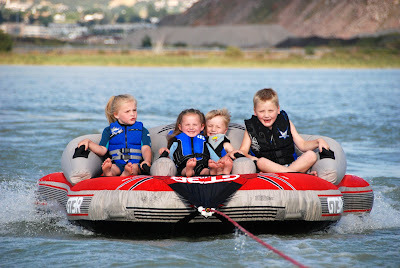 The kids all loved the tube, but the face of Ivy shows the anger at her dad for going too fast. She's not really so much of an adventurer. Oh, right, I've shared that about her before. Jade gave wake boarding a try and she got up and is now addicted. 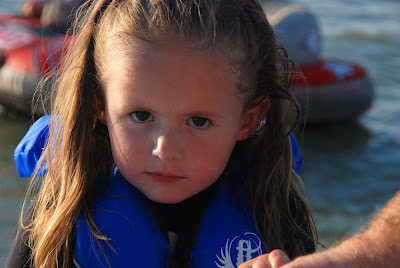 We had shown her videos of these cute little girls wake boarding and she figured she'd have to do it too. 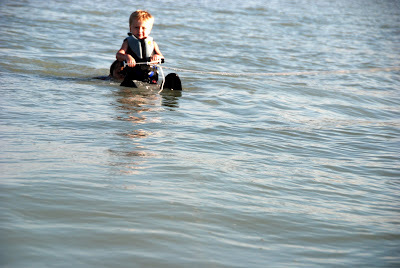 I'm just waiting for the day she starts trying flips over the wake. Oh sigh. 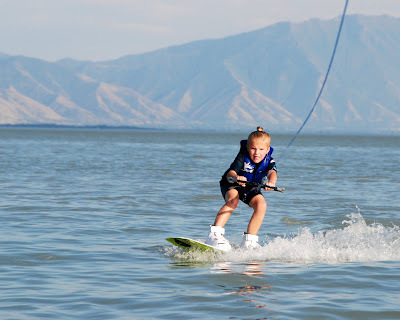 Harrison even gave water skiing a try. After a face plant or two, he decided to give it a try another time. To end the night, Scott gave Jade a ride on his surf board. She loved it and proceeded to surf herself. Of course I had already put the camera away so I don't have it documented with pictures- only words. so fun! looks like such a blast! someday hopefully we'll be a boating family too! maybe when we move back west. 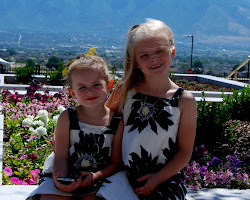 Ro- you will have to let us know next time you are in Utah, and it's sunny. We'll get together and go out on the boat. We miss you guys. It has been great catching up on your blog. Looks like you are having a perfect time. Love your blog about the purple turtle, I too have fond memories of the place. Your girls are so cute!